This is probably the most interesting Chelsea Grin by default, only because there’s something to say about it. This is the band’s first album without Alex Koehler fronting after leaving earlier this year to focus on his sobriety, and with guitarist Jacob Harmond also calling it time, it’s their first without any founding members. In their places arrives ex-Lorna Shore vocalist Tom Barber at the helm to push Chelsea Grin on, but let’s be honest – will it make all that much of a difference? Chelsea Grin have pretty much always been within the backdraft of deathcore, never progressing the genre in any meaningful way and always sticking on their straight, predictable path. It’s what made 2016’s Self Inflicted such a bland, forgettable listen, and given how deeply entrenched in that lane they are, there’s little chance than even a lineup change as major as this will do a whole lot. And yeah, that’s pretty much exactly right, as Eternal Nightmare is more of the same from a band who really can’t afford to do that anymore. It’s the exact same problem as Self-Inflicted had, too – overall, it’s sufficient, and anyone who’s jumped aboard the Chelsea Grin ship with have few gripes, but besides the fat, meaty chugs and constant stream of breakdowns that’ll inevitably get wheeled out again for the next album in a couple of years, is there any appeal from a band who refuse to even contemplate the idea of evolving? What’s even worse is that, with Barber being such a crucial new presence at the very front, he brings nothing to this album to distinguish itself in any way; he’s perfectly capable at dishing out whichever deathly scream the situation calls for, but this could simply be Koehler again for all anyone cares as his performance couldn’t be more stock. And is it even worth going over the instrumentation? Once again, Chelsea Grin have been plundering whatever supplier of royalty-free deathcore they’ve got in their contacts for another dose of same old, same old, sounding as sounding as imposing and destructive but ultimately hollow as ever. Besides the more theatrical darkness of Across The Earth or a slight verging on melody of Scent Of Evil, there’s no point picking out individual tracks; they’re all basically the same and they fade the second they hit, so why bother? And it’s hard to deny that Chelsea Grin have some appeal as far as the sheer, bloody-minded violence goes, but it never grows into something you could suitably make an album from, rather variations on a theme that even starts to go back on itself after about the second try. And here’s the kicker – if it came out that this album was rushed in development, it wouldn’t come as a surprise, because it feels it. Considering Barber’s total tenure in the band has been about three months – if that – there’s no way this is a band working to the best of their abilities. Of course, the fact that Eternal Nightmare is such a blatant rehash of literally every deathcore trope in the book is proof of that too, but not since Emmure’s Look At Yourself has the potential to take advantage of new blood and change for the better been so royally squandered. Really, there’s no point in this thing even existing. 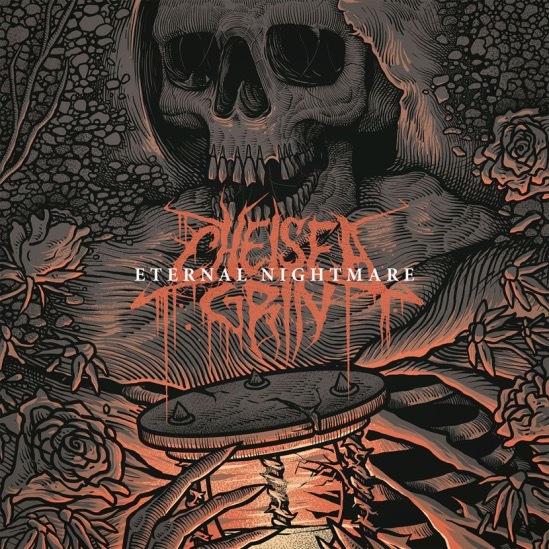 ‘Eternal Nightmare’ by Chelsea Grin is released on 13th July on Rise Records.